Join us on March 9 as we begin the 11th year of the Georgetown Second Saturday Art Attack. The FREE and family friendly Art Ride Bus tours the art destinations, including the west end locations such as studio e, the Shed Gallery and Equinox Studios, with pick locations throughout Georgetown, enabling your inner art lover to experience it all. Fantagraphics Bookstore & Gallery Patrick Moriarity presents Deep Artwork , an exhibition of paintings, prints, and drawings from his new collection of 3D art, with special guest Dame Darcy reading from her recent memoir Hi Jax & Hi Jinx . )pens Saturday, March 9 from 6:00 to 9:00 PM. All City Coffee presents Happening. Happening is a collection of information about arts-focused community projects coming to Georgetown in 2019 meant to inform the public about these projects and invite participation and feedback. Don’t forget to pin the map with places you find arts & culture! Brought to you by The Georgetown Super 8 Film Festival, Mini Mart City Park, and The Georgetown Arts District Committee. Johansson Art Gallery Come see the New Series in RED . Gorgeous hues of rich deep red pigmented paintings line the main wall of the gallery. Expressive, colorful and bold works of art featuring abstract Seattle city scenes, and landscapes. New paintings added to the walls weekly. We look forward to meeting new friends, and sharing the love in the Georgetown community. Rainier Glass Studio Become part of the glass art experience, browse the gallery of NW artists unique blown glass art and stay for live demonstrations at 7pm during Art Attack. Prairie Underground presents Nancy Jones . This series of watercolors references our human need for meaning using configured codes both familiar and new, creating complex moods with dialects of representational scenes with overlaid motifs and auratic light. The logos, more arbitrary and simplified appear to be the connecting narrative between the figures, detached and distant, allowing a space for reflection, while auratic light works with semblance. Jellyfish Brewing is showing new works of Elliot Howell . Elliot Howell’s work is divided into two main styles. One is brightly colored with a strong retro-disco-cosmic influence. The other is soft sketches of comic inspired models. Mediums include watercolor and black ink on watercolor paper. Georgetown Music Join us for Acoustic Armageddon #50 during Georgetown’s Art Attack featuring Bud Weather, Patrick Galactic, Wes Sp8 and TBASA . Our long running acoustic performance is always free and all ages. Adult beverages available with ID. HOUSEWRIGHT is a gallery and showroom with artifacts, art, furniture, lighting and textiles. Established by designer Tim Pfeiffer and architect Steve Hoedemaker as an extension of the duo’s desire to share a range well designed pieces for the home ranging from new production, found objects from around the globe, treasured antiques, and pieces sourced from workshops and artists. Featuring the work of Kim Van Someren, Sue Danielson, Emily Gherard, in partnership with Bridge Productions alongside artists, Alfred Harris, Jill Young Rosenast, Alex Marshall, and Nancy Fargo. Georgetown Arts and Cultural Center presents ” When you let the light in” a solo show of new oil painting and mixed media by Angielena Chamberlain. These new works focus on navigating the process of reckless and complicated love. Sometimes healing is laughter, sometimes tears and often times misunderstood by those around us. This is a playful look at how the artist decided to let healing happen in her own life. Open studios also include The Scarlet Crow is the business name of Karen , a gifted medium, and communicator of the Spirit Realm. 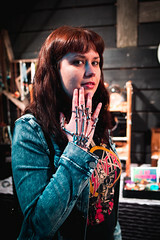 Karen specializes in Bone Casting. This can give clarity to what is happening in your life, and help determine if you are on your right path. Karen has a sarcastic wit, and is Not your mama’s medium. The Palace Theater and Art Bar Where local artists sell their art. Featuring artist Chris Schanz this month. You would need to travel out into the nightlife of Seattle to see Seattle photographer Chris Schanz in action, crawling on the floor through broken glass and rhinestones alike to photograph your favorite drag performance. Perhaps you’ve seen him patrolling junkyards of central Washington State looking for that perfect rusted hulk. Maybe that was him crouched down at the front of the mosh pit trying to get that ONE photo of the guitarist making “that face”. Here is your opportunity to see his new collection of “Altered States” in small format mixed media, as well as a few selections from previous exhibits in person! Landscapes, drag queens and rock stars, oh my! Mainframe Mainframe Moving Sale! Krab Jab Studio and Mainframe thank Georgetown for 10 wonderful years! March is our last month here, and we will be hosting a moving sale: art, prints, cards, books and photos will be discounted, including framed drawings by illustrator Bud Cook. Illumination Studio# 305 Color Intersects with Color . If you absolutely love color in all It’s form and glory then come into the studio that has the warmest, most brilliant display of color in abstract form. We have the collection of the most color of all the stops in Art Attack with Dari Stolzoff, Ferrell, Ramona Bell, and Badieh Bryant showing images in geometric, organic, and spacial images on paper, wood and canvas. Also don’t miss Luscious Leopard Lips, our talented D.J. with a Theremin, playing atmospheric music in the background. Come in and warm yourself without the fire. BOPBOX presents the works of artist Melissa Llamas. Her series of paintings is comprised of Abstractive Layers-Landscapes and Seascapes, using different mediums of watercolor, acrylic, gouache and pencil. Each painting captures the emotion in abstract expression. “With every subsequent painting there is continuous growth and inspiration for me.” Come and check it out at the BOPBOX, new to Georgetown featuring made from scratch Asian fusion cuisine! Elysian Brewing Tap Room is hosting Ink , an artist hailing from Maine. Her career began with painting graffiti on walls, under bridges, and on abandoned buildings. Through her love of hip hop, her creative mind erupted and inspired her to follow her true calling. Ink captures environmental dilemmas, beauty, humor, everyday life, and emotions to help people see life from her perspective. 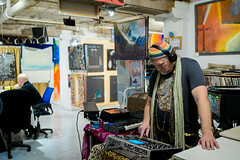 Fogue Studios & Gallery Live Music! Featuring Fougue Studios musician Andrew Sherbrook‘s acoustic guitar flow music. Tom Gormally‘s immersive sculpture exhibition, Fox in the Hen House . “Fox News has done more to divide this country than anybody in the last 50 years. That and talk radio,” -Tom Gormally. Don’t miss this installation before it goes to the Blanden Memorial Art Museum in Fort Dodge Iowa. Now thru March 31st. Often constrained by the rational limitations of production, this new collection of works explores a need for unabashed creative freedom. Neither objects, nor architecture while still referencing both in scale, vernacular and materiality. Designed to engage the audience in a conversation between the familiar and unfamiliar. These tactile experiments aim to give form to the unknown, clear reservoirs, and celebrate creating without boundaries. Equinox Studios is a growing arts community in sunny West Georgetown, home to over 100 artists working in an inspiring array of mediums, including dance, blacksmithing, welding, woodworking, cycle fabrication, sculpture, painting, film, glass and art performances monthly. Counterbalance Brewing presents mixed a media show by Rory Cooper. Exhibit runs through April 30. Fall in love with art with Georgetown Art Attack celebrating its 11th anniversary on Saturday, February 9 in Seattle’s romantic Georgetown industrial arts corridor. The FREE and family friendly Art Ride Bus tours the art destinations, including the west end locations such as studio e, and Equinox Studios, with pick locations thru out Georgetown, enabling your inner art lover to experience it all. Fantagraphics Bookstore & Gallery Jack Kamen‘s classic stories in comics like Tales From the Crypt, Weird Science, Haunt of Fear, and Weird Fantasy left a lasting impression on mid-century American youth. They sold in the millions, but were vilified by preachers and politicians, who claimed these comic books were the cause of juvenile delinquency and crime, leading to their ultimate demise. Kamen’s legacy has been preserved in the EC Artists’ Library from Fantagraphics Books. An exhibition of Kamen’s comics hosted by series editor J. Michael Catron opens Saturday, February 9 from 6:00 to 9:00 PM. All City Coffee presents Happening . Happening is a collection of information about arts-focused community projects coming to Georgetown in 2019 meant to inform the public about these projects and invite participation and feedback. Don’t forget to pin the map with places you find arts & culture! Brought to you by The Georgetown Super 8 Film Festival, Mini Mart City Park, and The Georgetown Arts District Committee. Johansson Art Gallery is a working studio featuring paintings, hats and sculptures by David Johansson. Formerly the Art Cave venue on Capitol Hill, now located above Via Tribunali, across from The Alice Gallery at 6007 12th Ave South. We will occasionally feature guest artists throughout the year. Expressive, colorful and bold works of art featuring abstract Seattle city scenes, and landscapes. New paintings added to the walls weekly. We look forward to meeting new friends, and love the Georgetown community. Seattle Freeze along with Curator/Resident Artist Hoa Hong present the works of Madeline Owen and Danthanh Trinh. Live music provided by Dayana Capulong and Amy Lp. 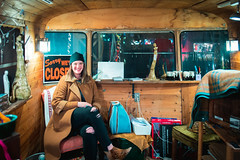 New to Georgetown and having just opened in the late Spring of 2018, Seattle Freeze is excited to join in on February 2019 Georgetown Art Attack! 6-9pm / Free Event / Family Friendly. Full Throttle Bottles presents Isaac Quigley a Seattle artist who uses paint and abstraction to represent science and biology. Come by Full Throttle Bottles for a beer or taste some wine provided by Petit Monde Wine Merchant, and we can discuss things like cavitation, imploding bubbles underwater, and whether the mantis shrimp or the pistol shrimp would win in a fight. Georgetown Music Join us for Acoustic Armageddon #50 during Georgetown’s Art Attack featuring Bud Weather, Patrick Galactic, Wes Sp8 and TBASA. Our long running acoustic performance is always free and all ages. Adult beverages available with ID. Georgetown Arts and Cultural Center presents ” When you let the light in” a solo show of new oil painting and mixed media by Angielena Chamberlain. These new works focus on navigating the process of reckless and complicated love. Sometimes healing is laughter, sometimes tears and often times misunderstood by those around us. This is a playful look at how the artist decided to let healing happen in her own life. Mainframe Featuring drawings on display by illustrators Socar Myles and Bud Cook , and rock photography by Paul Hernandez , Georgetown’s neighborhood frame shop Mainframe will be open during Art Attack. Come check out the art as well as frame options for your new art purchases! New customers receive $25 off their first custom frame (valued at $100 or more). Illumination Studio# 305 Color Intersects with Color . If you absolutely love color in all It’s form and glory then come into the studio that has the warmest, most brilliant display of color in abstract form. We have the collection of the most color of all the stops in Art Attack with Dari Stolzoff, Ferrell, Ramona Bell, and Badieh Bryant showing images in geometric, organic, and spacial images on paper, wood and canvas. Also don’t miss Luscious Leopard Lips , our talented D.J. with a Theremin, playing atmospheric music in the background. Come in and warm yourself without the fire. Fogue Studios & Gallery Solo exhibition featuring Fox in the Hen House, sculptures by Tom Gormally “Over the past two years, I have created a series of sculptures, as I process the bizarre and disturbing stories that are a part of world news today”.- Tom Gormally. In Gormally’s Fox series, he approaches ongoing political and cultural turmoil how he imagines a shaman would deal with these disturbances; by creating effigies to dispel the negative influence affecting our culture. Counterbalance Brewing presents mixed a media show by Rory Cooper. Exhibit runs January 18 – April 30. Spring Into the Georgetown Art Attack on April 13! 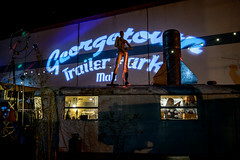 Ring in the New Year with the Georgetown Art Attack! Festive Holiday Georgetown Art Attack December 8!